The NY Times (sub required) reports that the company has hired Exposure Communications of London as its new ad agency, (talk about an annoying website) after firing the London office of Saatchi & Saatchi. The Times also reports that Dr Martens’ site has a contest where people can design their own boots and visitors can vote for their faves. I wonder if Andrew Adam Newman actually looked at the site because that contest is closed. Noting that Doc Martens became a global brand in the 70s without any real marketing, industry observers worry that too much success might ruin the brand for the core audience of 20-somethings who made it popular to begin with. 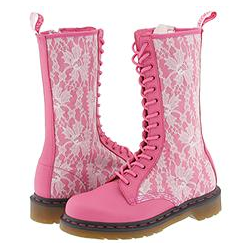 I think Doc Martens should worry about getting the all that stupid flash off their website instead. And for god’s sake, make the site searchable!